LANDED property enjoyed a fantastic year in 2010. Good Class Bungalows in the prime districts of 9, 10 and 11 did particularly well in terms of sales. But good performance was seen for all types of bungalows in the prime districts, and the eastern districts of 15 and 16. Total sales value of bungalows in these three categories alone amounted to $3.3 billion last year, 46 per cent higher than the sales done in 2009. A total of 88 Good Class Bungalows (GCBs) in districts 9, 10 and 11 changed hands in 2010, compared to 84 in 2009, an increase of about 5 per cent. These bungalows, located in designated GCB Areas, are sought after by ultra-high-net-worth individuals (UHNIs). Median prices for GCBs also saw the highest percentage growth among all bungalow segments last year. The median price for GCBs in 2010 was $1,129 per square foot, up 31 per cent from $865 psf in 2009. In fact, most owners who bought their GCBs five years ago would have enjoyed close to a 300 per cent appreciation in property values. These bungalows in the exclusive enclaves of Nassim, Tanglin, Dalvey and Cluny Park are in high demand as elite homeowners in these areas tend to hold on to such prized assets, making supply scarce. Besides GCBs, other bungalows in the prime districts have also experienced phenomenal growth both in terms of transaction volumes and price. A total of 95 bungalows changed hands in 2010 compared to 75 in 2009. The median price per square foot has also gone up from $1,018 psf in 2009 to $1,207 psf in 2010. It is getting more pricey to own a bungalow in the prime districts these days as most of them could easily command prices above $7 million. Demand for bungalows in Bukit Timah is naturally high due to their proximity to some of Singapore’s prestigious schools, such as Nanyang Primary School, Anglo-Chinese School (Barker Road) and Raffles Girls’ Primary School. Another popular bungalow market is in the eastern part of Singapore – in district 15 (which includes Katong and East Coast) and 16 (including Upper East Coast and Bedok). A total of 93 bungalows were sold in these two districts last year, 24 per cent more than the 75 transactions in 2009. The median price has also risen 28 per cent from $732 psf in 2009 to $937 psf in 2010. As prime district bungalows get pricier, some buyers have switched their search to the east where prices could be 10-30 per cent lower. Bungalows in Katong are in greater demand. Easy access to food amenities, the short drive via East Coast Parkway to the Central Business District and the presence of top schools in the vicinity are key reasons for the high demand for bungalows here. 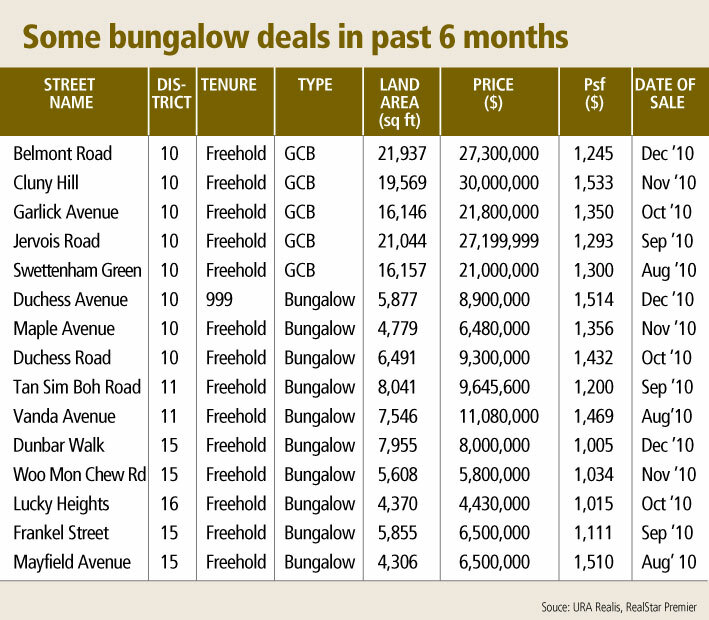 The Singapore bungalow market was poised for a superb bull run this year, with prices expected to soar by another 10-20 per cent until the government came out with its Jan 13 cooling measures. However, the new rules should have a limited impact on the bungalow segment due to the short supply and strong holding power of the owners. The lower loan-to-value limit on new private home purchases for those already servicing a housing loan should not pose a major problem to most bungalow buyers. In fact, most of these well-heeled buyers do not make use of the maximum financing. As well, owners of these bungalows, especially GCB owners, tend to hold on to their properties for many years. It is also the norm for them to own a few such properties to keep for the next generation. Despite the cooling measures, there are still many buyers searching for their dream bungalows. The only negative impact of the measures we have seen so far is a standoff between sellers and buyers. Sellers are unwilling to lower their prices while buyers are expecting price declines. This situation has created a price gap, which means fewer bungalow transactions are likely in the months ahead. There are still many offers coming in from buyers but these are generally lower than what sellers expect. In fact, we are seeing some sellers withdrawing their properties from the market, with a view to relaunching them six to 12 months later. Some have opted to lease out their bungalows instead of selling them, for the time being. Going forward, we expect the sales volume of bungalows to drop by about 20 per cent for the year. First quarter sales are likely to fall more steeply, by 30 per cent or more, before picking up again from the second quarter. The Chinese New Year festivities in February, coupled with the introduction of the cooling measures in January, are the main reasons for the big drop expected in Q1 sales. Short-term investors or speculators who usually look for a 10-20 per cent profit margin within one to two years are effectively driven out of the market by the punitive seller’s stamp duty in the Jan 13 cooling package. Bungalows with redevelopment potential may also lose some of their appeal. Before the measures, developers or investors would pay a high premium to own such bungalows. However, they now have to be prudent as their margins will shrink due to the higher stamp duty they will have to pay when selling the redeveloped properties. On the other hand, bungalows with existing tenancies seem to be the star attraction for investors. Despite a slowdown in bungalow transactions this year, prices on the whole are likely to remain stable, with a gradual increase of 5 per cent from 2010. With the economy doing well, bungalow sales should be relatively healthy even if they may not match the vibrancy of 2010. Overall household wealth has risen over the years and owning a bungalow is a growing status symbol. The upside potential for bungalows remains promising given that the price of a brand-new bungalow in a prime district would generally be below $2,000 per sq ft of built-up area. This compares well with a new condominium in the same vicinity which would be priced above $3,000 psf of strata area. Furthermore, we are seeing a steady increase in the number of ultra-rich Singapore permanent residents taking up citizenship here. This means they no longer face restrictions on the number of bungalows they can own in Singapore. All in all, demand for bungalows will remain strong, as long as interest rates do not rise dramatically, and there are no further cooling measures. Location: As with any property investment, location is the most important criterion in selecting a bungalow. When the market picks up, bungalows in prime locations will appreciate faster than those elsewhere. For example, many bungalows in the prime districts have tripled in value over the past five years. Those in the eastern districts have doubled over the same period. It is also easier to resell a bungalow in a prime district as there is a bigger pool of buyers. Shape and gradient of land: The best choice is a regular-shaped plot with a broad frontage as it allows the house to have an imposing entrance. And the land should be flat rather than undulating. Better still would be a plot on elevated ground, especially if it comes with a panoramic view, which is hard to come by. Zoning: There are various kinds of zoning for bungalow land – such as Good Class Bungalow Area (GCBA), bungalow and mixed landed. Only GCBs, which are governed by stringent planning requirements, are allowed to be built in a GCBA. For a plot zoned for mixed landed use, terrace and semi-detached homes as well as bungalows are allowed. Hence, zoning has a bearing on the prestige of the neighbourhood. Bungalows built on sites zoned specifically for bungalows tend to fetch higher values as there will only be bungalows in that area instead of a mixture of terrace, semi-detached houses and bungalows. Redevelopment potential: Due to their plot ratio and site specifications (such as road frontage and depth of plot), some bungalows have huge redevelopment potential, and these properties are much sought after by developers. This entry was posted in News and tagged Bungalows, English Property News, GCB, Landed Homes, Singapore. Bookmark the permalink.